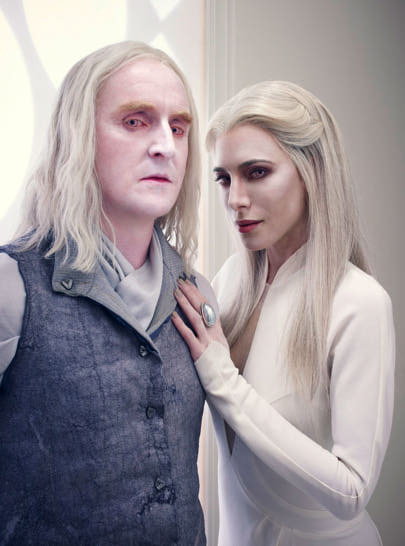 Anyone who has been following the blog knows that I have been taken with the new Showcase sci-fi show Defiance since its pilot, which I watched no less than 3 times. Defiance airs on Showcase on Mondays!!! The Mind Reels: Hi Jaime how are you? Jaime Murray: Hi Tim how are you? Good thanks. JM: I’m really looking forward to coming back. TMR: Yes, we – I’m very excited. We’re pushing all the buttons to get you into our studio to chat with us. We’re pushing all the buttons. JM: It’s my second home, yes. TMR: Excellent. Now that you’ve worked with American crews and Canadian crews what do you find the differences are like behind the scenes? JM: Oh, you know it’s interesting that you ask that. I was back in the UK publicizing Defiance, because the great thing about Defianceis it actually aired all over the world at the same time, so not long ago back in my home town of London and people were asking me about the move to when I first came to the USA. And I said I’m actually not particularly a very brave person. I actually – I couldn’t quite like fit. I don’t think at the time I wouldn’t have ever made the move to the USA except that I was on this TV show called Hustle and it got bought by an American station who wanted us to film two episodes of Hustle in the USA. And so I went over with my cast and everything and suddenly I’m filming in LA, and I suddenly realized that there’s something very universal about a film crew. And where I felt all this fear about making that move actually a film crew in Toronto or the USA or London, there’s a real similarity. There’s a comradery and you know within a couple of days everyone’s taking the mickey out of each other and you know there’s a short hand and it’s kind of a universal, it’s a universal thing – a film crew. What I would say is I’ve noticed – I would say that when I first went to the USA I thought because we spoke the same language obviously we were all speaking English and the you know it was just going to be warmer and it would be slightly different and slightly more glossy. But actually the more time I’ve spent in the USA the more different I’ve realized, there are cultural differences between Americans and the English, that I hadn’t fully acknowledged when I first came to the USA. But I think that Canadians are much closer to the English. I feel like they are only once removed whereas I think America is kind of four or five times removed from England. And also you can get a good cup of tea in Canada. The Americans can’t make a good cup of tea. JM: …for a cup of tea and they’ll kind of like they’ll make it with hot tap water and you know kind of spit it back out in the cup. TMR: And now do you have a favourite moment in the season for Stahma? JM: So many and I don’t want to give any spoilers away, but I think that it’s not a spoiler to say that already I think we’re at about six episodes in now right, and I think you’ve already realized that Stahma isn’t what she seems on the outside. And I don’t think anyone, even Datak, knows what her long term plan is. So that was really fun for me. She keeps her cards very close to her chest and she really wears a mask a lot of the time, so there was sometimes places in this season where the mask slips and I find that really fun to play with as an actress. So yes that’s one of the things I really liked about Stahma. TMR: Fun. Do we have a production date for Season Two? JM: What do you mean a production date? When we start filming? JM: …at the beginning of August, yes. TMR: That’s very quick, wow. JM: Yes I know right. TMR: Excellent. That sounds great. JM: Yes, but we were filming this time last year. TMR: That’s true yes I totally forgot that, because we – Julie showed up at our FanExpo here in Toronto. TMR: And did a little talk about it. Yes, so very exciting. TMR: Well yes we just had a Trenna Keating on our show and we told her the same thing is that we’ve got to get like a cast representation of Defiance at FanExpo this year. JM: She’s great, isn’t she great. TMR: She’s amazing I can’t wait for the show to go live because people are just going to be like she’s so cool. JM: Yes she really is. And that was it! Hopefully we can find time to chat with more Defiance cast as they come back into town, and maybe even in the studio!! It was so great to chat with her, she was a true joy, and I’m looking forward to meeting her in person, watch her on Defiance, and Warehouse 13! !